Your roof is your home’s number one source of protection from inclement weather conditions. It’s what keeps you warm and dry during the winter months as well as cool and comfortable during the hotter summer months. It sees everyday wear and tear, which over time can affect the overall condition of your roof. It’s important that you attend to any and all necessary repairs to get the most out of one of the most important aspects of your home. If you know you have a specific residential roof repair service you need to schedule, or if you simply need a professional to scope out the condition of your roof, you can trust our team at Endeavor Exteriors to handle the task with ease and efficiency. We offer an array of residential roof repair services, ranging from simple leak repairs to major hail or storm damage repairs. Our service areas include Denver and many surrounding communities, such as Aurora, Cherry Creek, Westminster and more. Contact us today to get started on your next roofing project. Continue reading below for everything you need to know about residential roof repair, such as when you need it, when you need a replacement instead, and other frequently asked questions regarding a residential roof repair service. Your roof can experience an array of issues that warrant the assistance of a professional roofing team. The sooner you address these issues and schedule a residential roof repair service, the less you’ll have to spend in emergency costs later down the road. Below, we’ve listed some of the most common residential roof repair issues you might experience as a homeowner in the Denver area. If your roof was poorly installed, you’ll likely experience a world of problems — specifically, more roof repair issues than the average homeowner and a lower lifespan for your roof. Hire a professional roofer to ensure your roof was correctly installed. We get it all here in Colorado — wind, rain, snow, sleet, hail and ice. These weather conditions can lead to moisture build-up under the layers of our roofs, which can cause issues such as molding, rotting and leakage. The trees that hang above or near your home may be an ideal way to add natural beauty to your landscaping, but they can wreak havoc on your rooftop. From their leaves clogging up your gutter system to entire tree branches falling on your roof, it’s important to properly maintain the larger trees surrounding your home to prevent serious roof damage. When you ensure your roof and attic have proper ventilation, you’ll extend the overall lifespan of your roof and create an energy efficient air movement throughout your home. If you ignore your roof’s ventilation, you’ll notice damage to your rafters and shingles, insulation problems, sheathing, molding issues and more. When your roof membrane shrinks, you’ll likely notice cracks in the upper layer of your roof. When this occurs, you’ll notice blistering, splitting and surface erosion of your shingles, which will inevitably lead to bigger repair issues down the road. It’s important to have a professional roofer perform routine maintenance on your roof to prolong its lifespan and ensure everything is working as normal. When you invest in regular maintenance, you can often catch minor roof issues before they become major emergencies. When you don’t, though, you’ll likely get hit with an expensive, emergency residential roof repair service since you weren’t aware of the condition of your roof. Inclement weather conditions can lead to holes in your roof. It’s important to patch these punctures up as soon as possible to prevent further leaks and interior damage and to ensure those who reside in your home are always safe and secure. If you’re experiencing any of the issues listed above, please immediately reach out to our roofing team at Endeavor Exteriors to schedule a residential roof repair service. If your issue isn’t listed above, don’t hesitate to still give us a call and we’ll help you find a solution that will get your roof back to working as normal in no time. It’s the age-old question we’ve gotten for years: Should I invest in a residential roof repair service, or should I completely replace my rooftop? Well, this all comes down to a variety of factors, a few of which we’ve listed below. The extent of your roof damages are minimal. Your shingles are curling, cracking or completely missing in only a few areas of your roof. The shingles on you roof are wet or dark in only a few areas of your roof. You find that some pieces of your roof’s shingles are ending up in your gutters. You see general wear and tear around your chimney, vents, skylights and/or other openings on your roof. You can see light from outside when you’re inside of your home. You’ve noticed stains on your interior ceilings and/or walls. Your roof deck is sagging. Your energy bills are unusually higher than they normally are. The exterior paint of your roof is blistering or peeling. You are getting repeated leaks in the same areas. The shingles on your entire roof are deteriorating or completely damaged. You find that you’re spending money on repairs more often than you once did. You have large-scale moisture, mold build-up or water damage on several areas of your roof. Your roof is old — specifically, anywhere between 15 and 20 years of age, or even older. A recent major storm hit your city and wreaked intense havoc on your roof. You want to opt for a more energy efficient roof material that will help you save on your energy bills. You want an entirely different roof aesthetic or appearance. Our roofers at Endeavor Exteriors can perform a thorough, detailed inspection of your roof to identify the extent of damage on your roof. From there, we can evaluate the overall condition of your roof and help you make an informed decision of whether you should opt for a repair or replacement service. Contact us today to get started. Have a question about residential roof repair? Below, we’ve listed some of our most frequently asked questions regarding residential roof repair services. Q: What is the best roofing material for my roof? A: The answer to this question ultimately depends on how you want your roof to look, how you want it to function and what your overall budget looks like. Read more about the pros and cons of the type of roofing materials we offer at Endeavor here. 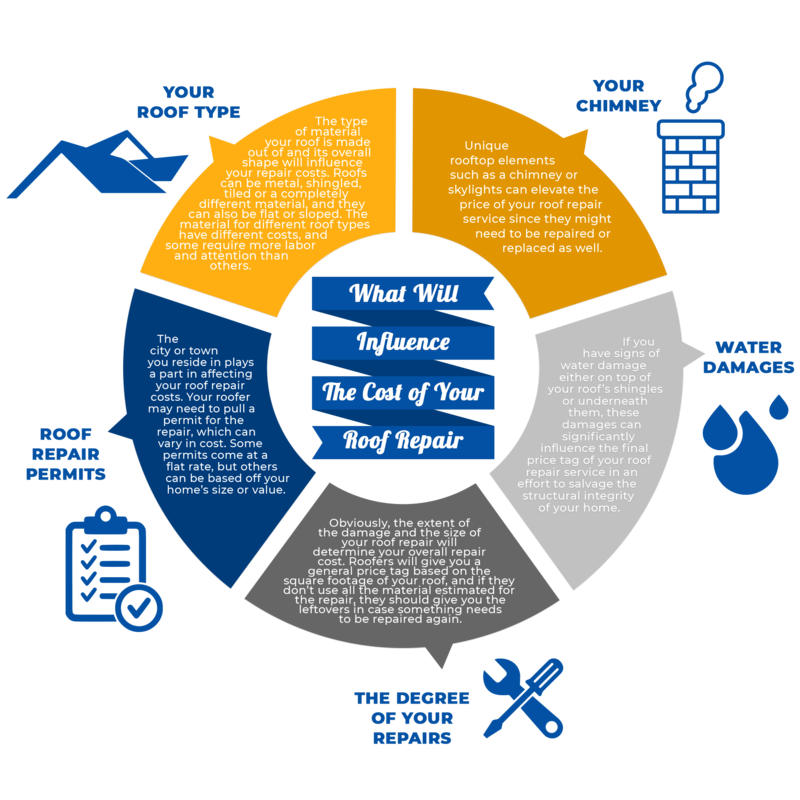 Q: How much do residential roof repairs cost? A: The price of a residential roof repair varies on an array of factors, such as the extent of your damages and the size of your roof. For example, a larger roof repair project like a structural repair will take longer and will cost more, whereas a simple project like a flashing repair won’t be nearly as time-intensive or pricey. Q: Can I perform roofing repairs by myself? A: Although you could perform a roof repair yourself, we recommend against it — especially if you have no prior roofing experience. The job can be difficult and dangerous, and if you don’t know what you’re doing, you could end up making your roofing problem even worse. On top of that, you could void any warranties you have. Leave residential roof repairs up to the professionals and you’ll experience fewer headaches down the road and a better quality roof. Q: How can I locate where my roof is leaking? A: If you can’t physically see where your leak is coming from, you may need the assistance of a professional roofing team. Leaks are often difficult to track down, as water tends to traverse across the rafters and other structural support systems in your home before pouring on your ceiling or walls. If you do know where the leak is located, take note of its exact location to better inform your roofer and speed up the residential roof repair process. Q: How can I prepare for an upcoming residential roof repair service? A: If you have any special belongings in the room where your roof repair service will be, move these items while your roof is being repaired. For example, hanging pictures might fall as we hammer away on your roof, so take the time to put these in a safe place. Same with any patio furniture or items that are located outside of your home — protect these as well from any falling debris. If you have any pets that are uncomfortable with loud noises, you might want to find a sitter or board them while we work on your roof. A residential roof repair service can get rather noisy, and we don’t want to stress out your furry family members. We offer an array of roof repair services at Endeavor Exteriors, ranging from leak detection to flashing replacement and storm damage repair. If you have any residential roof repair questions that aren’t listed above, please feel free to reach out to our team. Contact us today for more information. We get it — roofers seem like they’re a dime a dozen in the Denver area. You might be tempted to choose the first roofing company you come in contact with when it comes to a residential roof repair service, but there are many benefits you reap when you opt for Endeavor as your roofer, such as advanced technology and an experienced roofing crew. Learn more about why you should choose our one-of-a-kind Denver roofing company below. At Endeavor, we’ve created and utilize advanced technological techniques and strategies that make your life easier. We developed an online and mobile app that allows you to access daily logs and real-time updates on your roofing project — complete with photos and project documents. We can also provide you with a 3D model of your home upon request, so that you can test out roofing materials and colors before making a firm commitment. We’re not your grandpa’s roofer. We’re capitalizing on today’s day and age of technology, and we can proudly say that it’s one of the many reasons why we’re one of the most trusted roofing teams in the community. We are properly licensed and insured in the areas we perform residential roof repairs in, and we’ll gladly show you our credentials whenever you ask for them. Our number one goal is to be the most transparent roofer you’ve ever worked with, which is why we developed the technology that we did. Whenever you have a question or issue with our services or crew, don’t hesitate to reach out — we pride ourselves on always being open and honest with our clients. It’s basic knowledge — the more experience a roofing staff has, the more likely it can efficiently deal with and tackle any issues that arise during a roofing service. At Endeavor, we have more than 75 years of combined experience on staff, and there isn’t a problem we haven’t encountered. We never cut corners and always find the best roofing solutions for our customers, which is why our core values include honestly, communication, courage, passion, selflessness and more. We’re a Top Rated Local® roofing company based in Denver, and we’re dedicated to improving the roofing industry as a whole. We are never complacent with our work, which is why we’re always looking for new and innovative ways to better ourselves. When you choose Endeavor, you choose a company that will always provide you with the best roofing materials, warranties, services and experiences — no matter what. No matter the repair that is needed for your roof, we’re sure that we’re the team for the job. Our crews have more than 75 years of combined experience in the roofing industry, and we have an A+ rating from the Better Business Bureau. We have experience working with many different types of roofing materials, ranging from asphalt shingles to stone-coated steel, and we ensure to always be transparent and over-communicative with our clients. There’s a reason we’re a leader in the exterior restoration industry — we know we can give you a roofing experience unlike anything you’ve had in the past. Get your roof back to looking and working as it used to. Call us for more information about our services or to schedule your next residential roof repair service. You can reach our team by calling (720) 464-3472 or by completing our form online. ©2018 Endeavor Exteriors® - Do not copy. All rights reserved.